Reliability is dependent upon shared understanding and beliefs. Managers at all levels must understand how their decisions and directions often impact adversely the ability of their organization to achieve and perpetuate Reliability…thereby undermining realization of broad business objectives. 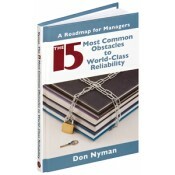 This book identifies and explores fifteen cultural obstacles commonly encountered by most organizations in their pursuit of World-Class Reliability. The intent is to provide senior management with a wake-up call. They must address the identified obstacles the people they have charged with pursuit of reliability (middle managers, engineers and functional specialists) can be successful. Otherwise, senior management is its' own worst enemy. It is a must-read for Senior Managers at all levels (Corporate to Plant and within Plant at Departmental levels). • Examines the larger issues (culture, leadership, commitment, consistency) that functionaries cannot overcome without strong senior management involvement. • Focuses on the managerial leadership, cultural change, organization-wide commitment, and perseverance required to transform the operational environment from reactive to proactive. • Uses illustrations to visually convey Principles and Concepts of Maintenance/Reliability Excellence. • Includes appendices that provide generic tools and plans used to drive the essential change.